Oxidizing agents are used to control dough strength and elasticity during high-speed production of bread. Oxidizing agents, or oxidizers, are used to improve the mixing and dividing properties of bread dough. 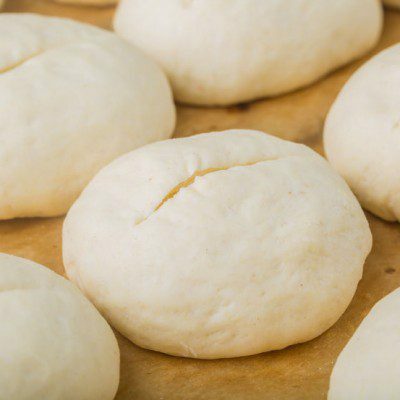 They enhance gluten reformation, which helps control dough strength and elasticity. Used as dough conditioners, oxidizing agents are a necessity in the high-speed production of bread. The first oxidizer was put into use in the 1900s after it was discovered that oxidizers could artificially “age” the flour quicker than bleaching, giving it desirable baking qualities. The first true oxidizing agent was discovered in 1967 by Jackel and Diachuk. Their patent was for the use of ascorbic acid in continuous bread systems. For the oxidizing agent listed in the following text, ascorbic acid and cysteine can be either natural or synthetic. Enzyme-active soy flour and glucose oxidase are natural. All the others are synthetic chemicals. Originally flour was naturally aged through exposure to the atmosphere. Oxidizing agents primarily affect sulfur-containing amino acids, ultimately helping to form disulfide bridges between the gluten molecules. The addition of these agents to flour will create a stronger dough. Ascorbic acid1 — Ascorbic acid can either be a natural extract or synthetic product. An example of natural ascorbic acid is acerola fruit powder, the dried juice of the Acerola cherry, with 17-19% pure ascorbic acid. At the mill, flour is treated with typically 0.5-3 g of pure ascorbic acid per 100 Kg. Very soft glutens or flours for certain applications (mainly frozen dough) require a large dose of 6 – 10 g. Ascorbic acid doesn’t act on the protein directly. Ascorbic acid is first oxidized to dehydroascorbic acid (DHAA) at the beginning of the kneading process with the aid of the flour’s own enzymes (i.e. ascorbate oxidase). The DHAA oxidizes glutathione to glutathione disulphide with the aid of the flour’s own enzyme glutathione oxidase, thus eliminating the gluten-softening effect of glutathione. Over-dosage of ascorbic acid could soften the dough. Azodicarbonamide (ADA)2 — Azodicarbonamide is a compound with the molecular formula C2H4O2N4. Azodicarbonamide doesn’t react in dry flour, but does react during the process of making dough. When mixed into dough, it oxidizes the sulfhydryl (SH) groups and exerts an improving effect. The oxidation is rapid and almost complete during the mixing of dough for 2.5 min. ADA is used where a faster maturing agent is required. Treatment levels ranging from 2 to 45 p.p.m. of azodicarbonamide are required to accomplish maturing, the amount depending on the grade of flour. If trying to create a more organic product, it is best to find a natural substitute for ADA. Bromate1 – more precisely potassium bromate. Bromate oxidizes glutathione very slowly without the need for an enzyme. It results in very good fermentation tolerance and a high volume yield. Because of doubts about its health effects, it has gradually been replaced by ascorbic acid since the 1950s. A further problem is that it accelerates fire and explosion. Because of the low doses required and its low price, bromate can hardly be replaced without intervention by public authorities. Potassium iodate1 – reacts fast in dough. Potassium iodate doesn’t occur naturally but can be prepared by reacting iodine with potassium hydroxide. It is banned in several areas of the world, including the EU. Calcium iodate – reacts fast in dough. Calcium iodate [Ca(IO3)2.H2O, CAS Reg. No. 7789-80-2], also referred to as lautarite, does not occur naturally but can be prepared by passing chlorine into a hot solution of lime (CaCO3) in which iodine has been dissolved. Enzyme-active soy flour1 – one enzyme from soy flour, lipoxygenase, also has an oxidative effect on the protein of the gluten. However, the gluten-strengthening effect of soy flour is comparatively slight; its bleaching effect is more important. And the use of lipoxygenase is limited because the enzyme creates a “green” flavor that is not desirable in its application. Glucose oxidase1 – usually derived from mold or honey. It oxidizes glucose into gluconic acid with the aid of atmospheric oxygen and transforms water into hydrogen peroxide. It is usually used at a dosage at 100 – 500 ppm on flour (about 1,500 to 7,500 units of glucose oxidase per 100 kg of flour). Its suitability is greatly restricted by its taste. Calcium peroxide1 – upon heating, calcium peroxide can be used in various oxidation reactions. The effect of calcium peroxide is not very pronounced, but it is appreciated for its surface-drying property. For this reason, it is always used in conjunction with more effective oxidizing agents. Larger amounts reduce the volume yield and cause excessive browning. Azodicarbonamide can be used as an aging and bleaching ingredient in cereal flour and as a dough conditioner in bread baking. The total amount used is not allowed to exceed 0.0045 percent (45 parts per million) by weight of the flour used, according to the article 21CFR172.806.3 The name of the additives and the concentration should be labelled. Potassium bromate is allowed to be added in a quantity not exceeding 50 parts to each million parts of finished bromated flour according to the FDA article 21CFR137.155.7 According to FDA code of federal regulation 21CFR136.110.8 Potassium bromate, calcium bromate, potassium iodate, calcium iodate, calcium peroxide, or any combination of 2 or more of these if the total quantity, including the potassium bromate in any bromated flour used, is not more than 0.0075 part for each 100 parts by weight of flour used. For other dough strengtheners and dough conditioners, if not ADA, potassium iodate, potassium bromate, calcium iodate and calcium bromate, the total quantities of such ingredients or combination is not more than 0.5 part for each 100 parts by weight of flour used. Oxidizing agents used shall be declared on the label, including the name and the concentration used. “Oxidation and Flour Maturation” http://muehlenchemie.de/downloads-future-of-flour/FoF_Kap_18-3.pdf. Accessed 21 Feb. 2017. “Azodicarbonamide (ADA) | Baking Ingredients.” Bakerpedia. www.bakerpedia.com/ingredients/azodicarbonamide-ada/. Accessed 21 Feb. 2017. “CFR – Code of Federal Regulations 21CFR172.806.” Accessdata.fda.gov. 01 Apr. 2016. www.accessdata.fda.gov/scripts/cdrh/cfdocs/cfCFR/CFRSearch.cfm?fr=172.806. Accessed 18 Feb. 2017. “CFR – Code of Federal Regulations 21CFR182.3013.” Accessdata.fda.gov. 01 Apr. 2016. www.accessdata.fda.gov/scripts/cdrh/cfdocs/cfcfr/CFRSearch.cfm?fr=182.3013. Accessed 18 Feb. 2017. “CFR – Code of Federal Regulations 21CFR184.1635.” Accessdata.fda.gov. 01 Apr. 2016. www.accessdata.fda.gov/scripts/cdrh/cfdocs/cfcfr/CFRSearch.cfm?fr=184.1635. Accessed 18 Feb. 2017. “CFR – Code of Federal Regulations 21CFR184.1206.” Accessdata.fda.gov. 01 Apr. 2016. www.accessdata.fda.gov/scripts/cdrh/cfdocs/cfcfr/CFRSearch.cfm?fr=184.1206. Accessed 18 Feb. 2017. “CFR – Code of Federal Regulations 21CFR137.155.” Accessdata.fda.gov. 01 Apr. 2016. www.accessdata.fda.gov/scripts/cdrh/cfdocs/cfcfr/CFRSearch.cfm?fr=137.155. Accessed 18 Feb. 2017. CFR – Code of Federal Regulations 21CFR136.110.” Accessdata.fda.gov. 01 Apr. 2016. www.accessdata.fda.gov/scripts/cdrh/cfdocs/cfcfr/CFRSearch.cfm?fr=136.110. Accessed 18 Feb. 2017.